For many years this family granola recipe was a staple in the Katz home. Our children grew up on it and we were right behind them with bowls in hand. Over the years we made a few simple changes…replacing vegetable oil with our own KATZ Organic Extra Virgin Olive Oil…full of Omega-3 fatty acids that are so good for your immune system...and we switched out most of the sugar for our own KATZ Varietal Honey with just a pinch of organic brown sugar...and we increased the amount of 'warm' spices...cinnamon and nutmeg...for the increasing awareness of their health benefits to help control cholesterol and blood sugar levels. Our KATZ Honey And Almond Granola is as much about the 'provenance' of the ingredients as it is about the nicely balanced morning flavors. 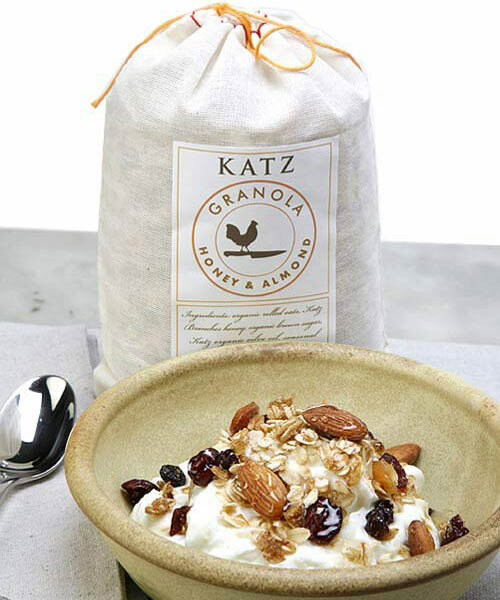 We use our own KATZ Farm estate extra virgin olive oil for richness, KATZ Honey for the balanced sweetness, spices from a local shop that grinds them daily, new crop raw almonds from local growers, and certified organic and non-GMO rolled oats, finished with organic dried fruit and organic flax seed too. Our “ingredient” list remains small and “readable” and you can rest assured that we take great care since our family eats KATZ Granola as well. Serve with milk or yogurt drizzled with a little extra honey or just scooped up by the handful as a snack...and "bee" healthy!